Ahhh the calm before the storm! I am so dang excited that the Nsale starts tomorrow that I can barely sit still! So actually, who am I kidding, today feels like the storm before the storm! Ha! But it’s a dang good storm! And let me just say up front, this is NOT a sponsored post. I’m just super obsessed! The Nordstrom Anniversary Sale happens every July and it is seriously one of the happiest times of the year for me! No joke! Last year the sale landed one week after I gave birth to Molly and I was so excited that I was in the mall at Nordstrom shopping the sale with Kevin in the car waiting with Molly just in case she needed me to breastfeed her. It’s pretty comical thinking back on that time now. But I just love this sale and I didn’t want to miss out! The Nordstrom Anniversary Sale officially starts tomorrow for people who have a Nordstrom credit/debit card. It’s called Early Access. And then the sale is open to everyone a week later. But don’t worry if you don’t have the Nordstrom card because today’s look on Ali Luvs is super affordable even though it’s not part of the sale! The beautiful maxi dress I’m wearing is only $55! This gorgeous dress is just so perfect for summer time. It can be worn over a bathing suit. Or you could wear a cute little bralette underneath. Or if you’re feeling risky/free (he he) you can go sans bra underneath like I am. 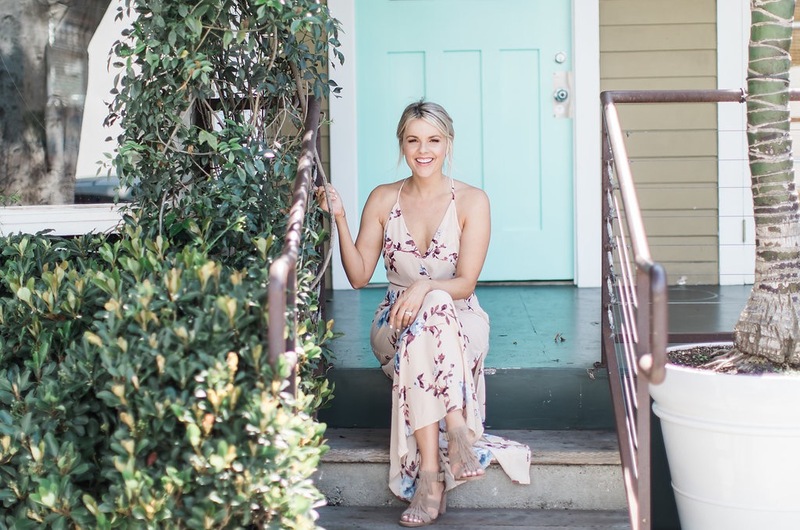 I think this maxi dress would be really beautiful for a vacation you may have planned this summer or just a day by the beach! I’m wearing a medium FYI and this dress comes in three different colors/prints. And it’s breastfeeding friendly! Got to love that! I’ve had these fringe heels for a while now. You can see me wearing them HERE with another look a few months ago. And I just love them! You’re going to be seeing me wearing these a lot over the summer. So if you decide to get them for yourself, I’ll be able to show you a bunch of different ways to wear them. I like that they’re neutral so can be worn with almost anything, but have the fringe detail which make them special. They’re also super comfortable! They’re one of the few pairs of heels I can wear all day and not have my feet hurt. And they’re under $100. So anyway, I wanted to share a little affordable look with you guys before the Nsale starts! And if you don’t have access to the Nsale tomorrow, you can STILL get this at a great price since it’s just affordable in general! SO excited for tomorrow! It feel like Christmas Eve! Calm before the storm indeed. Never shopped on Nordstrom before, and I’m so excited for my first try to be its sale! It is fun. It’s gonna be a fun day at nordys! I love Nordstrom! And I am so happy most of ur items are from there because I LOVE ur style!! LOVE the Nordy sale! My bestie and I have a date to play!!! Have fun! Ps. Your molly is a DOLL! I may need to get a Nordstrom credit card! Ha! That’s what I said last year and I don’t regret it for a second! What do you do about breast feeding when you wear a dress like that? Doesn’t your milk leak? I love the look, but I feel like any bra would look weird with it and I’m scared my milk would leak!! Not when you have a 1 year old. My leaking days are over. Ha! Lucky !!! I’m at 2 months and it happens a lot 😩 Love you and your blog! I loved you on the bachelorette and then started following you again this last year because I had a baby boy born last April! So he and Molly are only a few months apart, which has been fun to watch your journey with her as I’ve been having my own journey into parenthood too. Thanks for sharing, the fitpregnancy interview and photo shoot were great! Awww thanks Sarah! And thanks for leaving me this nice comment. It means a lot! Ali, I loved you on the Bachelorette. I have taken so much of your advice as a new mom. I just had a baby boy who will be 6 months on the 18th of this month so him and Molly are pretty close in age. I love your sincerity and honesty about everything. And Molly is beautiful may God always bless her and you and your family with a lot of health and happiness!